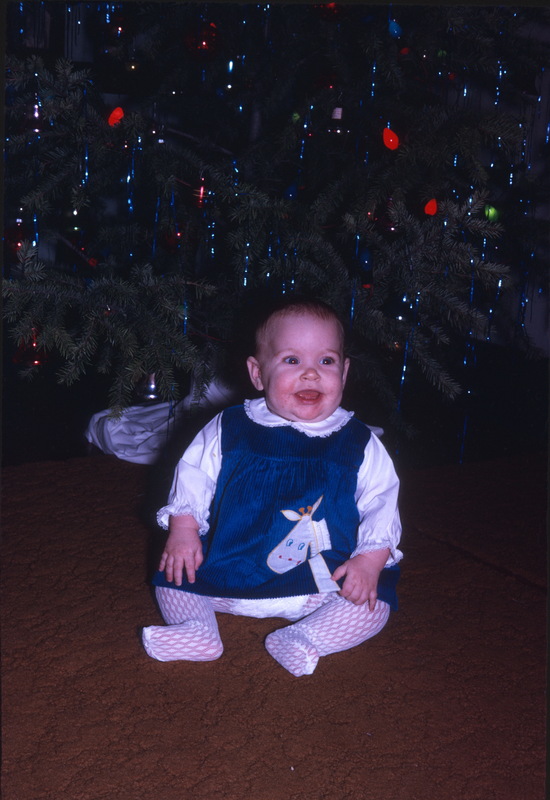 I got lost today looking at old family photos from late 1970. So I decided to take you with me! Our headliner is Son’s first professional style hair cut. Not in a barber shop, but at the Bible College. Probably by a student who did this on the side. So far we’re only half-way there. I hated to see his sweet locks shorn! Here’s his sharp new big-boy look! I love this rather strange combination. 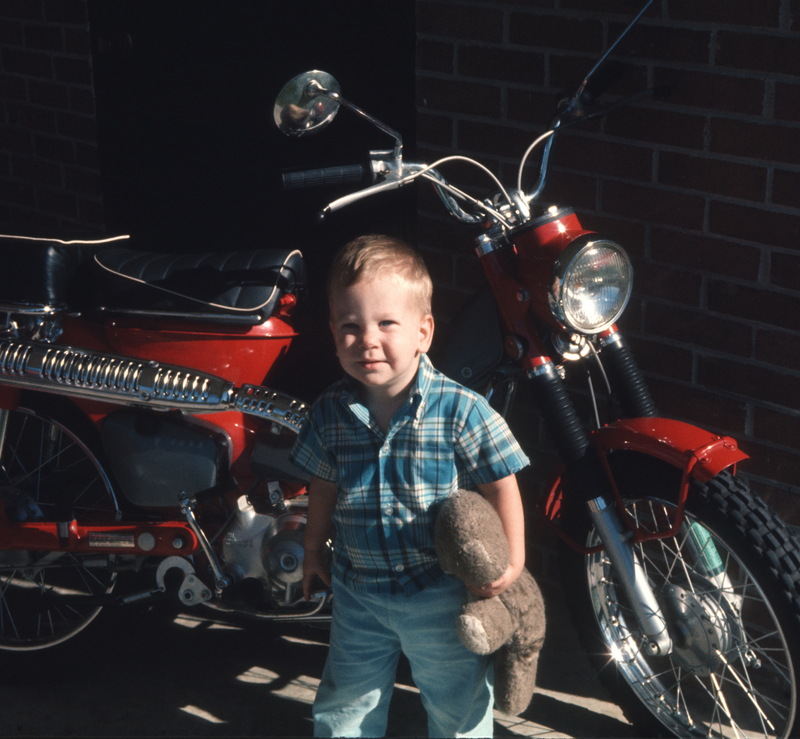 Son, looking quite mature with his new haircut, is checking out that sleek red motorcycle while clutching his faithful, well-loved stuffed bear. 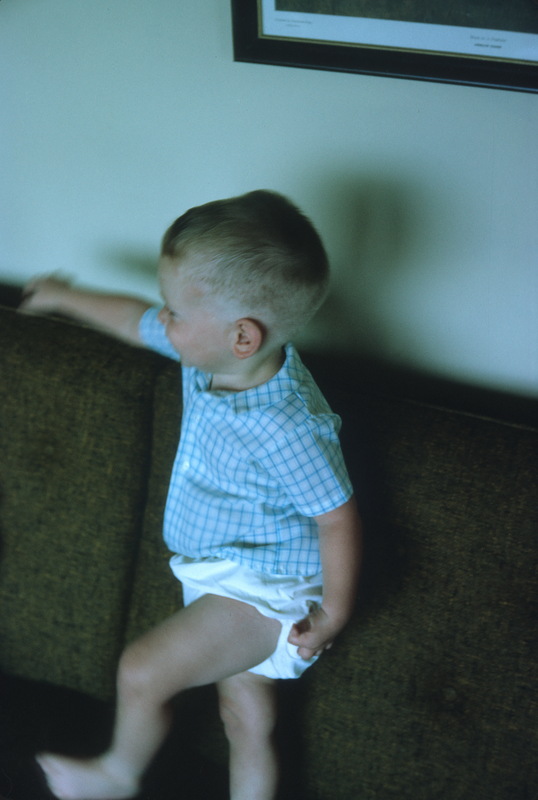 In August 1970 he turned two years old. What a guy! 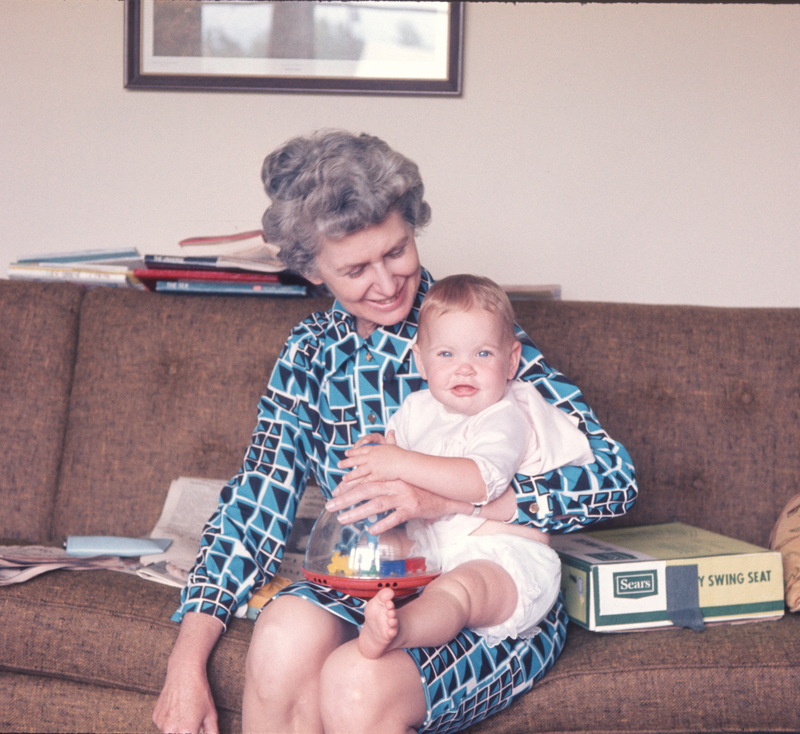 Next we have Daughter, now about 3 months old, sitting on Gigi’s lap, holding a push and spin Fisher Price toy. Gigi is D’s mother. Note the children’s books conveniently located for instant reading pleasure. Gigi was a technical reference librarian for the military, and served tours of duty in Germany, Korea, Vietnam and Arizona. 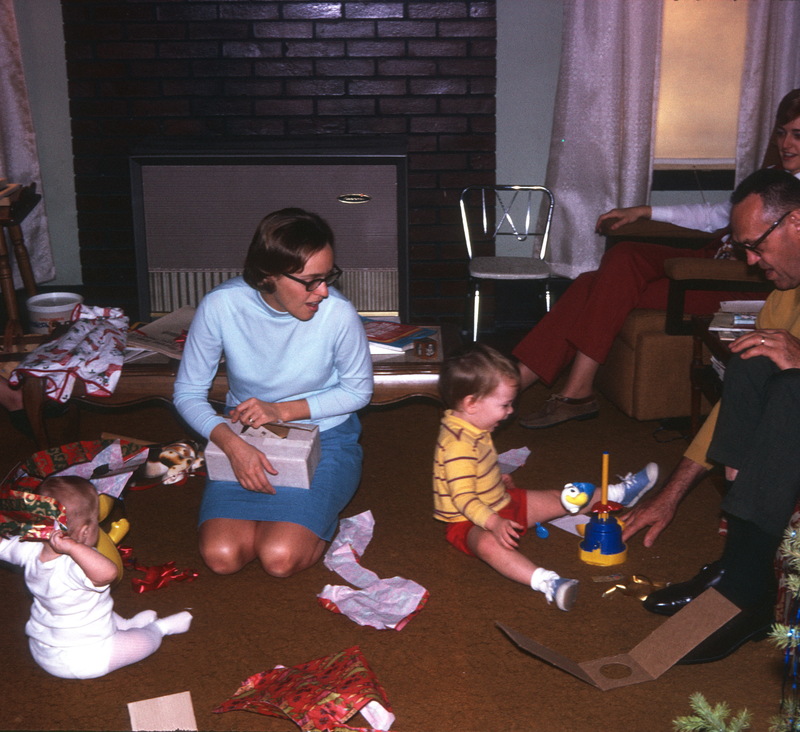 Christmas 1970! We’ve driven down to Savannah to be with my family. It isn’t Christmas Eve yet–no presents under the tree. But you can see Daughter is thrilled with whatever’s going on! Actually, she’s modeling a new outfit someone (Grandma, I think) had waiting for her when we arrived. 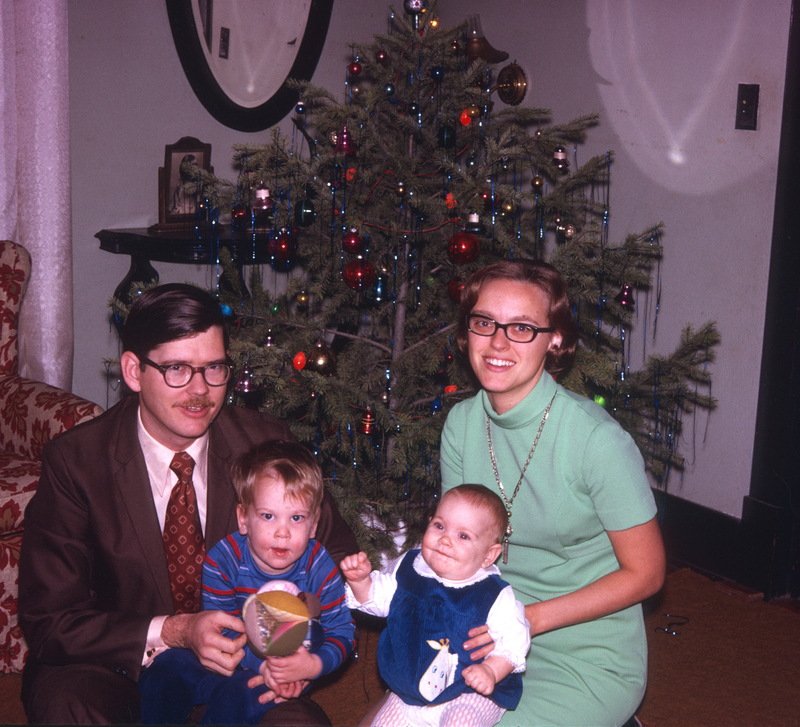 And here’s our little family in front of the same tree. The ornaments got unpacked every year and then carefully put away for the next year. I’m guessing the shirt Son is wearing was waiting for him at Grandma’s house. I’m wearing one of my favorite Sunday dresses–made by me. D is wearing his new red moustache and a dress shirt with cufflinks. Finally! Christmas Eve. Daughter is modeling a brand new holiday robe made for her by Grandma. Even though she didn’t put this outfit together, she seems to like it! Christmas Day. Son has probably shaken and inspected each wrapped gift. Daughter isn’t sure what all the excitement is about. 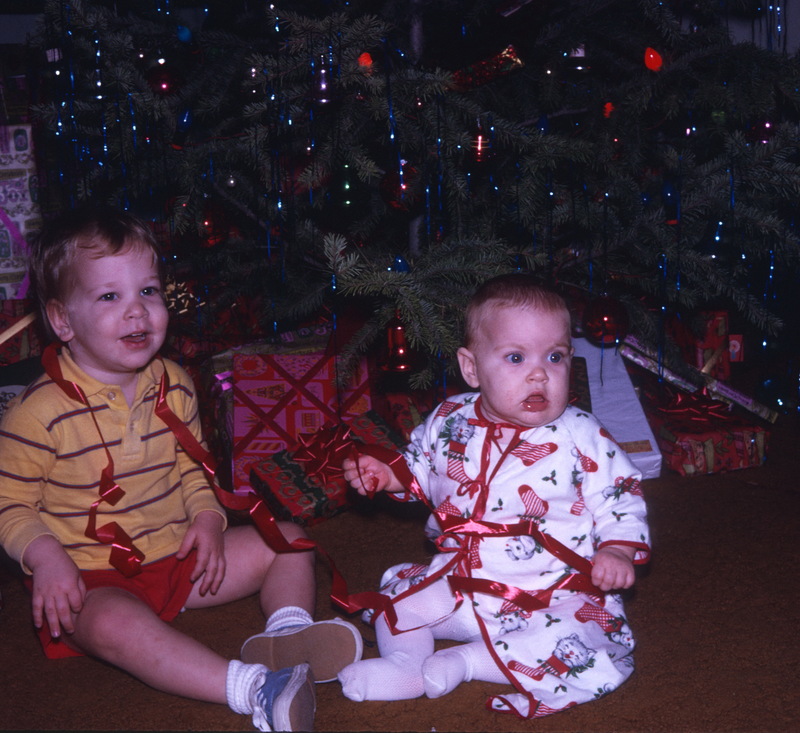 The ribbons were, I think, a way of passing time while they waited for all the grownups to assemble. My father always insisted on reading the Christmas story from Luke’s Gospel before we opened any gifts. This was to help us keep our priorities straight. Since he’s in charge of this Savannah house, I’m guessing we did the same thing–and sang a Christmas carol or two with Mom accompanying us on the piano. One last photo! 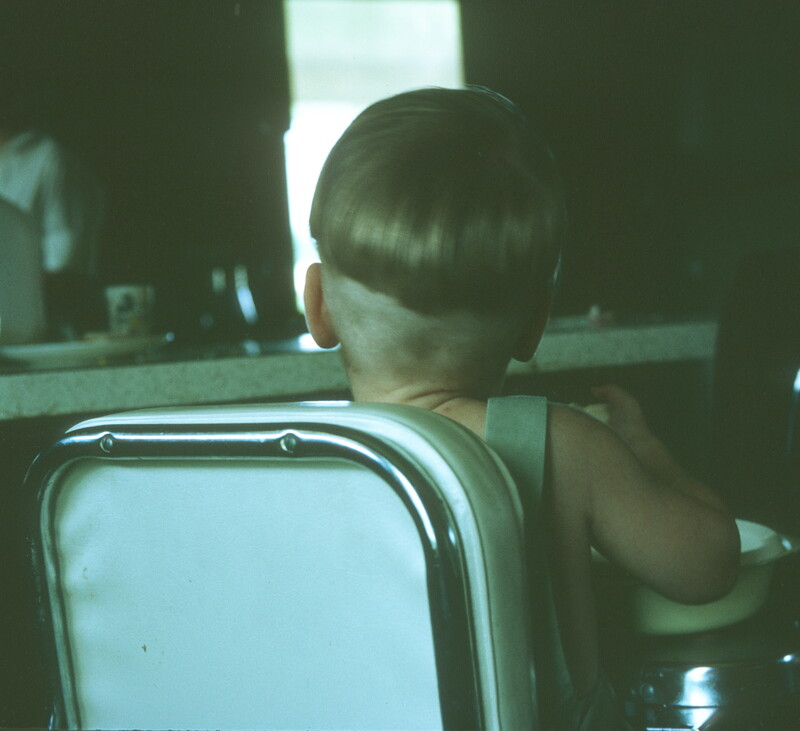 That’s Diane in the corner chair, my father in front of Son. 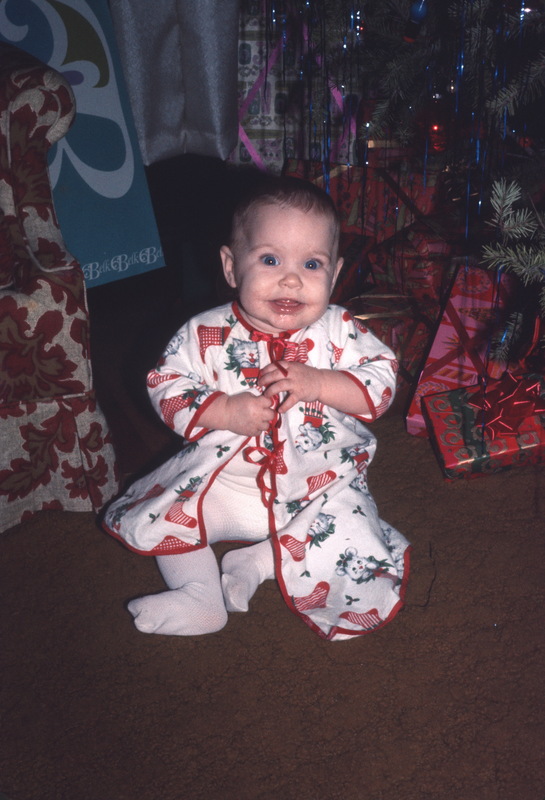 Daughter, minus her new Christmas robe, seems content with a crinkly piece of wrapping paper! I don’t have a clue what I’m trying to tear open. Son is ecstatic about the noise his new Fisher Price toy makes when you push the lever and Donald Duck flies off into the air (I think). Maybe someone out there remembers how it worked? If you’re still with me, you get a gold star! Thanks for indulging me. Just love digging through old pics. Thanks for sharing. Aren’t they the Best??? Thanks for perusing! I love these old pix, especially the motorcycle/teddy bear one. Thanks for sharing! I get all goose-bumpy looking at them! Even better looking back! It’s nice to be on this side of history. We have so much to be grateful for.